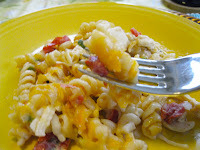 Talk about an easy dish to prepare and definitely can be considered a "comfort food" as well! 1. Heat oven to 350ºF and spray a medium casserole dish with non-stick spray. 2. Cook the pasta according to the package directions, but reduce the cooking time by two minutes. 3. In a medium pot heat the oil over medium heat. Once it begins to shimmer add the onion, garlic and pepper. Cook until they begin to soften, about three minutes. Add the cumin, coriander and salt and cook for an additional two minutes, or until the spices become fragrant. 4. Add the flour and cook for three minutes, stirring constantly, until all the flour is moist. Gradually whisk in the milk and stir until smooth. Bring the mixture to a simmer and allow to thicken. 5. Turn off the heat and add the cream cheese and 4 oz of the shredded cheese and whisk until melted. Stir in the Ro*Tel tomatoes. 6. Pour the pasta into the prepared casserole dish, stir in the shredded chicken and sauce. Top with the remaining shredded cheese. 7. Bake 20 to 30 minutes, or until pasta is bubbly and the cheese has melted. Let stand 5 minutes before serving. Yes, you guessed it, I didn't have enough penne so used rotini. By using the low-fat milk and reduced-fat cream cheese, this dish went from a rating of "high in saturated fats" to low. I used a large, deep nonstick skillet and mixed the pasta and chicken in with the sauce before pouring into the casserole dish. Because I was concerned this dish would be too spicy with the whole really large jalapeno I bought, I only used approximately a third of it - definitely could have used the entire jalapeno. Of course, should I make this dish during the summer when the peppers are hotter, it may only need a half. So guess I'll have to experiment and make this again - what a sacrifice, but oh so willing to do it! My friend nor I could really taste the spices - so may increase the amount as well next time. Don't get me wrong, this dish is still really creamy and good.